Global warming alarmists routinely predict that permanent ice and snow in the Arctic and Antarctic will soon disappear. But before Climate Change makes the glaciers near the poles disappear, it must first melt the glaciers in the tropics. Yes, there are actually many glaciers and permanent snowfields in the mountain ranges between the Tropic of Cancer and the Tropic of Capricorn. Indeed there are glaciers near the summit of Kilimanjaro just a few miles from the equator. There are some two dozen glaciers in Mexico, all of which are south of the Tropic of Cancer. Just as with elsewhere, prevailing news reports have predicted that the Mexican glaciers will all disappear within the next two decades. 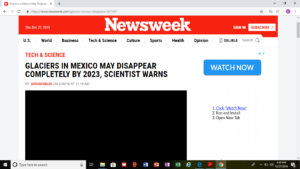 A March 30, 2018 Newsweek article entitled “Glaciers in Mexico may Disappear Completely by 2023, Scientist Warns,” quoted Mexican glaciologist Hugo Delgado Granados as saying that all ice bodies on Iztaccihuatl (Mexico’s 3rd-highest mountain) will likely disappear “in five or 10 years.” Thus, by 2023 to 2028. The same Newsweek article stated that “glaciers atop Popocatépetl [Mexico’s 2nd-highest peak] had become extinct” by 2001. Readers are left with the impression that climate change is to blame for this “extinction.” But Popocatepetl’s massive volcano erupted in 1994, blasting all glaciers on the mountain to smithereens. Numerous eruptions since then have kept glacier activity on the mountain to a minimum. The Mexican government has banned all climbing on Popocatepetl since 1994. The omission of this most basic fact—that Popocatepetl’s glaciers became “extict” not from climate change but from volcanic eruptions—can only be described as misleading.